Just to share with you a few thoughts on Bill Marr. 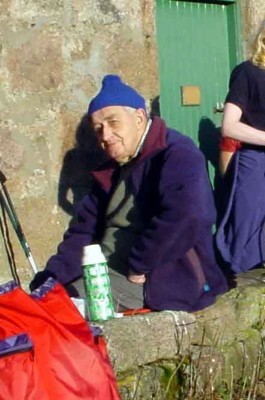 Bill was a stalwart NEMT supporter - he lived close to the Belmont Club and was a regular attendee and contributor to Council Meetings representing Aberdeen Hill Walking Clubs. I think we could all see in these later years it was quite a challenge for him to get along but he always contributed to the discussions and I will certainly miss him. Bill was someone who would almost always turn out for the NEMT Council meetings and lectures. His heart was in the hills and although he couldn't be there as often as he liked, he contributed as much as he could to keeping our landscape in good shape for the future. Sadly, we report the death of Bill Marr (aged 83) in June this year. Bill was for many years a loyal and respected member of the club who was actively involved in all club activities until very recently when he went into hospital. He was part of the original organising group when the club reformed in 1946, following the war years, and had since served as a committee member, chairman and treasurer during this long period. Bill was probably more widely known as our club representative on the NEMT where he kept us up to date with the wider hillwalking and environmental issues. Bill was principally involved in writing up the route sheets, providing interesting historical backgrounds and sources of information to many of our walks. Bill was a very quiet, personal man who had a great love of the hills and a wonderful wealth of knowledge of the local area we walk in. He will be sadly missed by many, but certainly not forgotten.